On Friday evening I held a beautiful ceremony in London, the first of my Goddess Circle in person events, in which I took 15 women on a journey of release, discovery, and desire. The energy was so magical I had an instant urging to share it with all of you, followed by mild frustration as I realised flying all over the world to see all of you is not as easy as it once was (I now have a two month old baby), and actually… last time I flew all around the world to see you guys in person, I covered 17 cities in 6 weeks and swore blind I’d never do it again! But, knowing me, I will do another world tour again at some point, and will probably have another baby… wow I’m a sucker for punishment! Ha! Anyway, discussion for another time! It’s a beautiful Sunday evening and I’m contemplating my Full Moon wishes in preparation for tomorrow and truly fully wholly desiring more conscious relationships in my life. More connection, more community, more sharing, more giving and receiving. Just more of that sacred space and sanctuary we sat in on Friday night. So I felt called to share something with you. Something from my archives. Last year, on the Blue Moon, I held a virtual Goddess Circle, with almost 200 women in attendance (I think I’ve remembered that correctly) in which I channeled the Goddess Isis and invited all in attendance to dance around the sacred flames through guided meditation. 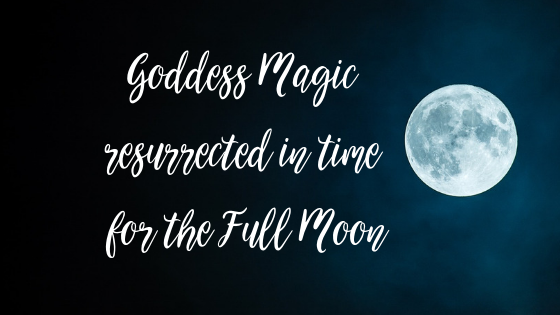 It was truly one of the most powerful experiences of my Priestess-hood to date, and I would love more of you to witness the Divine Feminine grace in yourselves through ceremony. So I’ve pulled the magic from the archives and I’m making it available to you guys again, just in time for the Full Moon! I urge you to dedicate two hours of your life to dance with the Goddess and call in all of your wishes and dreams for this year, on the first Full Moon of 2019. Holding you in your strength and power as you journey through this sacred space.